With Online Skype Web Lesson, you can take Japanese lessons anytime at your home! Wherever you are in Japan or in the world, you can talk with a Japanese tutor who lives near Tokyo and speaks in a perfect standard Japanese accent. Intermediate conversation course、Composition & Speech course、Keigo (polite expression) master course, etc. Course will be arranged to meet your needs. Do you feel uneasy about having lessons through internet? Here is a testimonial about online lessons from my student. "Having studied Japanese in both the traditional one to one way and via skype I can honestly say that skype is just as good as being there in person. Rather, I should say skype is EXACTLY LIKE being there in person and anyone thinking of studying in this fashion should have no concerns that a skype lesson lacks the authenticity of a man to man set up. There are several skype advantages that I as a skype student currently enjoy, such as avoiding all travel related hastle, being able to study in the comfort of my own room and not having to waste ages writing down notes during the lesson. It is a lot easier and more reliable to simply cut and paste notes than to rely on my own hasty handwriting. In this day and age it is totally logical for a motivated adult learner to make the most of the technology that is available at our fingertips. Skype lessons, combined with regular use of WordChamp flashcards→ and a touch of determination can prove highly beneficial for meeting the needs of any learner of Japanese. I have no hesitation in recommending this methond of learning." First session (counseling&trial lesson) is free. First contact me→ →Have a free couselling & trial lesson → payment →Start your lesson! Please pay fees by bank transfer or by Paypal →（Credit Card Payment from abroad) in advance of lessons. Please note that you will be charged a handling fee for the transfer. 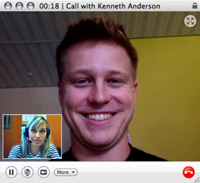 Skype video call is free. Please purchase your textbook via Amazon.com or else if necessary. There are cases that I send you materials in PDF document by email. You can book a lesson a week in advance by e-mail. You can change your lesson appointment up to 2 hours before the appointed time, after that 1 session fee will be fully charged. Please note that your fee payment is valid for 3 months and nonrefundable. Why don't you take a free counseling & trial lesson first and see if we can talk online!